Also duration is not the issue. In fact a spring will follow a 304 x 8.2mm cam to a higher RPM than it will follow a 264 x 8.2 cam. It is the lift and more importantly the lift to duration ratio. A spring will have more trouble with a 264 x 10.4 turbo cam because it is accelerating open at a higher speed, the mass has more inertia pulling it away from the lobe and then the lobe is dropping away from the spring faster meaning you need more spring to keep it in contact with the lobe. Just rough guessing if you increased the ratio the same I would guess the max RPM would stay about the same. So if you can spin a 264 x 8.2 spring to 9000 without floating then multiply each by 1.1 and I would expect you could run a 290 x 9 to the same RPM without floating. The longer the duration the more time the spring has to keep the follower in contact with the lobe and as with most things force / time is what matters. not to argue... as responding to an aggressive ramp is important... but I'm talking about duration from a total rpm POV.. more duration = more cycles per moment of time. However have recently learnt I bent 8 intake valves when the belt snapped. Haha no it wasn't anything like that. I didn't do an engine mount bolt up tight enough, it vibrated, sheared off and it fell into the cambelt cover housing and then shredded the belt and bent the timing belt guide. Zombie-ising this thread.... when I decided to supercharge my bluetop a millennium ago following the failure of the crank pulley pin, I ordered a set of TRDUSA 4AGE valve springs from an old TRD catalog. I had already a set of HKS 264/256/8.32mm cams, 7AFE 0.8mm head gasket and during the rebuild of the shortblock I've installed a set of 1985 Euro-spec AW11's 10:1 MAP 4AGE pistons. Interference engine no more, I thought. 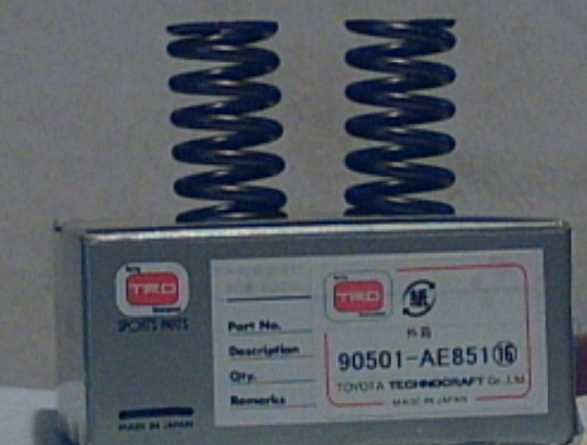 So, at what valve lift would these springs bind? If good to 10mm of lift, then bind should be a minimum of 11.27mm - Ideally you want .050" between max lift, and coil bind.